Because of the sunspot's location near the limb, the flare was not Earth-directed. Future eruptions could be, however, because the Sun's spin is turning the spot toward Earth. Sunspot 930 will be visible for the next two weeks as it glides across the solar disk. *Correction: Initially, we reported that the X9-class flare came from sunspot 929. The correct number is sunspot 930. "The last tornado in this part of Egypt happened in 1981," says Ibrahem. Strong tornadoes are born in rotating thunderstorms called supercells. To make a supercell, you need a cold, dry mass of polar air crashing into a warm, moist mass of tropical air. These two kinds of air frequently meet in the mid-section of the United States--hence Tornado Alley. But they rarely meet in Egypt. Indeed, there was no supercell over Alexandria yesterday. 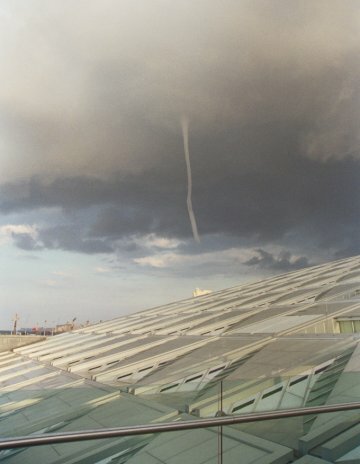 The twister Ibrahem saw was probably a lesser form of tornado called a "funnel cloud," which didn't even reach the ground. Nevertheless, "I was lucky to catch it," he says.